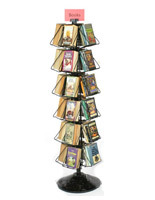 Looking for a simple way to showcase reading material? 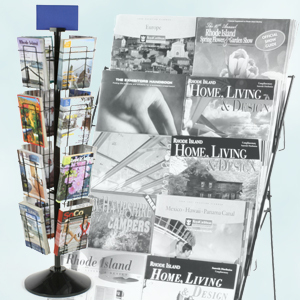 These wire magazine stands are sturdy and offer maximum visibility of their contents making them great point of purchase fixtures. 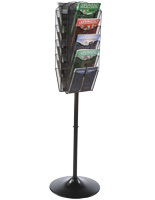 The convenient displays have a strong aluminum and steel construction for any high traffic area. 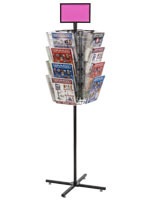 The floor standing tiers include simple newspaper holders, adjustable book shelves and versatile spinners that can rotate and maximize storage space. 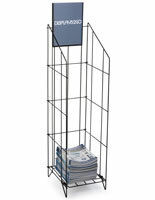 Available in black, white or chrome, these tiers are great for retail stores, libraries, offices and many other venues. 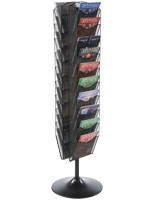 Not only are the displays for publications, but they are also excellent for other merchandise, such as DVDs, Blu-Rays, CDs and video games. 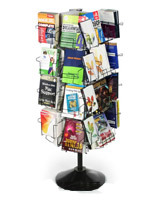 The wire magazine stands, also known as metal literature racks, have a folding lightweight construction that makes them portable and ideal for trade shows, conventions and other public events. 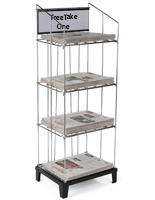 What types of metal literature racks are there? 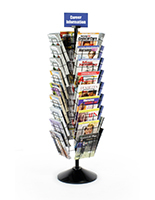 The aluminum and steel wire magazine stands can come in traditional tabloid holders that keep publications laid flat and facing up toward the customer. 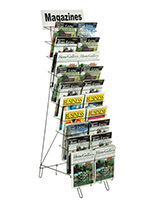 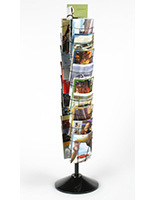 These floor standing displays can be wide enough to hold newspapers or small enough to comfortably fit magazines. 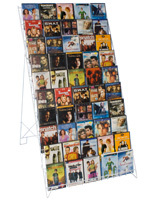 This type is sold in the “open rack” style or with multiple shelves. 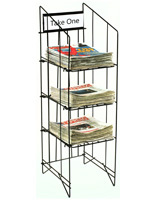 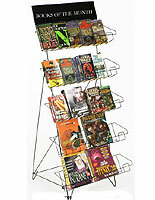 Spinning metal literature racks are excellent for keeping a large quantity of literature in a small space. 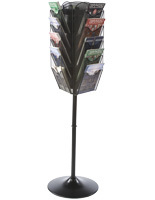 These displays have tiers of pockets on all four sides that showcase merchandise in every direction. 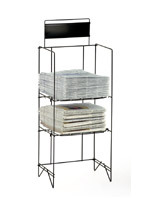 The black spinning tiers can also accommodate varying sizes: from large magazines to paperback books. 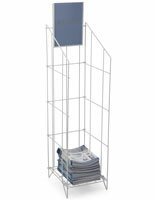 The displays can feature up to (36) shelves for holding a large quantity of goods! 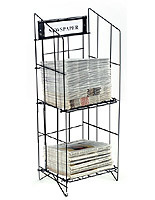 Customers will be able to see more publications at one time with these angled steel spinners. 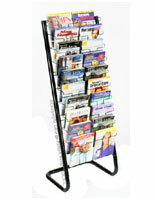 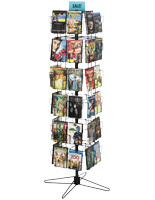 Angled wire magazine stands have organize merchandise into rows and have deep pockets for a variety of items. 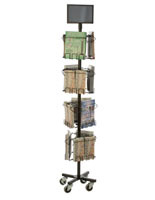 These displays have a lightweight construction and are collapsible for easy transport. 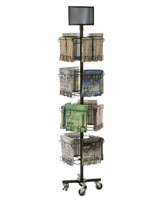 These fixtures also save space with their tiered design that shows the front cover for maximum visibility. 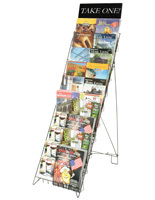 Adjustable book and magazine stands have moveable sections for more merchandising freedom. 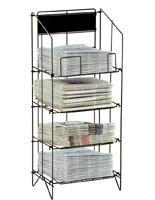 These black floor standing racks can hold many different publications at one time with the ability to change their display size. 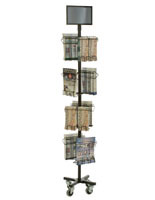 With the extra room, toys, candy bars, bags of chips and other impulse items can be showcased in these adjustable book shelves. 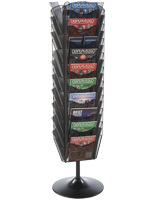 These aluminum and steel stands have a variety of designs and uses. 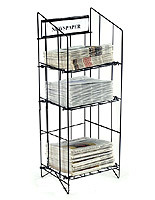 The metal literature racks are available in black, chrome and white, neutral colors that complement any environment and décor. 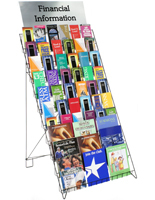 Because of their lightweight construction and durable materials, the stands are great for trade shows, markets, libraries and other high-traffic areas. 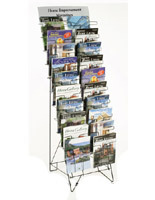 Most displays have an area for custom signage that can simply be printed and inserted into the frame. 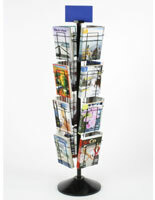 These versatile magazine holders are ideal for showcasing any number of publications of any size.